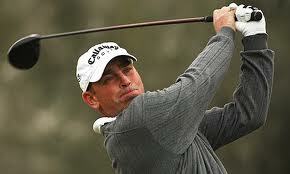 Denmark’s Thomas Bjorn set the early pace at the British Open with a magnificent 65. The 40-year-old stormed to a five-under-par 65, with seven birdies against two bogeys, to take the early clubhouse lead, as favorite Rory McIlroy struggled to get going before steadying for a one over 71. Bjorn, even with a stumble at the final hole, he was in the clubhouse with a one-stroke lead over Miguel Angel Jimenez and six strokes ahead of U.S. Open champion Rory McIlroy, who got off to a sluggish start. Others off to a good start were Spanish veteran Miguel Angel Jimenez who signed for a 66, one behind Bjorn, while England’s Simon Dyson came in with a 68 on an overcast, rainy day along the Kent coastline. Bjorn was the last player into the field, getting his spot Monday night when Vijay Singh withdrew due to injury.